This word RSVP is a french word that means 'responde seevou plei' [spelling not sure but thats how it sounds]or in english 'please respond'. This word has been widely used and printed in invitation cards but not many understand or choose not to understand or pretend not to understand what it means. Most oftenly the invitation card also states 'RSVP before...the date but most oftenly what happens is that either the invitees reply the last minute on the day of the function itself and expect to be given a seat or never reply at all but just turn up at the function or replied to turn up to the function but never came!The most common one will be 'I was not well'. This is the culture in Malaysia. By doing all of the above we are showing disrespect and being inconsiderate to the host. It means that the host is not important and you can't be bothered with whatever inconviniences that will happen to her as a result of your doing.Unless you are really genuine then your conscience is clear. Ask yourself how would you feel if it happens to you at your function? Lets start making a conscious effort from now on. My Book Launch 18th April 2009 PWTC! My dream came true finally. It's true what i believed that it's not God's denial but God's delay. My mom always say to me that whatever you wish for just ask from god and he'll give it to you. And he finally did. I started writing four years ago about my experiences and then I took up a course in Image Consulting in Singapore & London. I found that the techniques and what they have taught me would be a waste if not documented. 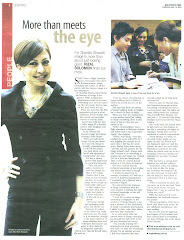 I owe it to Ms Christina Ong the Principal Consultant from Academy of Image Mastery, Singapore. A very charismatic lady full of grace and a person with a big heart who's willing to share with me her knowledge an expertise in this book as my guidance. I finished all the chapters 2 years ago but could not publish it because I could not afford it. I looked for sponsors from individuals, companies, ministries and also entrepreneur development organizations but there were only empty promises. There was a time when I just wanted to give up on the book and just forget about it. I felt as if there was no point initiating anything good in this country. People will only give you the attention if you are somebody important to be associated with...like the Prime Ministers wife...etc. One fine day I was invited to do a talk for a bank organized by Karangkraf Publication house in Kuala Lumpur. It went really well and after that I was approached by the publication house Buku Prima a subsidiary of Karangkraf . She asked me if i was interested to write a book on Image as there is a demand for it in Bahasa. So far there wasn't any book about Image in bahasa. When i heard that, my heart was pumping really fast and of course I said yes and we got into a discussion and i signed the contract right away! We started the project right away because I had completed all the chapters and did the shooting in October last year. The lay out was completed only in early March because Buku Prima had to finish up their novel books first. There were many postponement on the date of the launch due to Umno assembly that was going on. And also it was also due to the change of My vvip guest to launch the book. Call it ambitious..but if don't try you'll never know... I wrote to the Permaisuri Agung to invite her to launch it and was supposed to be in a hotel..but of course she couldn't make it because she was supposed to leave to Argentina. Then I wrote to Datuk Seri Ng Yen Yen the Womens minister then but she too could not make it due to her travelling schedules. I tried my luck to invite Tan Sri Rafidah Aziz and without much hassle or delay her PA Dato Yasmin called me to confirm that she agreed to launch my book. I always knew I could count on Tan Sri Rafidah Aziz. She is a woman with high integrity in everything she does and I truly respect her for that. After all it was also she who launched my salon Adamaya 5 years ago. 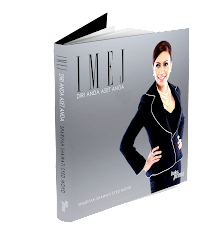 The launch went really well and Tan Sri Rafidah was the perfect choice. Everybody loved her and her speech was awesome. !We took the opportunity to launch it at the same time of the book fair that is being held in PWTC. We also have a booth there.I was told that the book is currently selling very well by the publisher thank god!! It was indeed a memorable day for me and what more all my family members were there to support me. Most of my close friends turned up. On top of that i consider myself very lucky to have a team of committee members who were so dedicated to make the event a successful one. I am also grateful to my BFF Marianne Liow for her endless effort to assist me and be there for me in my most trying times and happy times. As a conclusion, i believe that you have to have faith in whatever you do and never give up. Stay away from toxic friends because the are just.. well toxic to you. Never forget your family and of course the almighty -God. Anyway we are giving a 20% discount on the book from 17th - 26th April during the book fair. So get a copy for yourself now! What's with this 'thats mean' thing? That's it . I've been hearing too much of this 'thats mean' and i can't stand it anymore. To my amusement the people who used these words were from the high ranking post in an international organization and nobody dares to correct them. I think it's about time these people are told and corrected because it reflects on your Image and the company that you work for. I mean.. here you are smartly dressed in your most expensive suit but you are not being 'Congruent' with your corporate Image when it's not in sync with your verbal communication. So I am suggesting that , all the top people in the company must attend the Image Workshop on Communication Skills first before sending us their staff. I believe if you want change then you have to change first. Yes , clothes do communicate messages but how you communicate and the choice of words you use tells a lot more about you - educated or not? So for goodness sake it is 'that means' not 'thats mean'.